Things have been a bit crazy since my letter to the Universe last week. And yes, the Universe is still messing with me on a consistent basis. But I don’t want to write about all that just yet! I’ve been putting off getting a hair cut because my fundage has been quite low. I was due in December but decided to wait until yesterday. I’m religious about getting at least a trim every 6-8 weeks so waiting until 10 weeks was torture! I had also been toying with the idea of chopping it all off. See, even in December I was dreaming of the great chop! 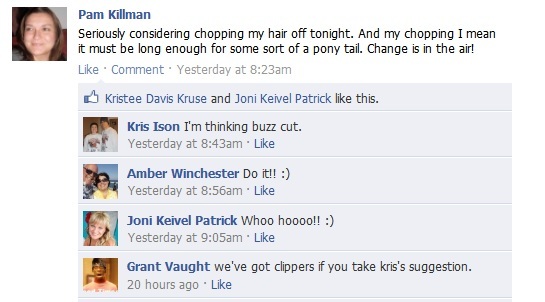 So last night was the great chop. And as you can see, I got lots of great advice. I did not go with the buzz cut! As you might be able to read in my blurry image above, my only requirement was a pony tail. And Miss Joni did not fail me. I have never felt so comfortable with a stylist. I just come in, sit down, give her minimal direction and get great hair every time! I wanted to get a picture of the massive amount of hair on the floor but she was afraid I might freak out a bit so it was swept up before I could snap one. It was a good 4-5 inch cut. I’m pretty sure I lost a solid 2 pounds and will take 10 seconds off my mile time with the new do – totally reasonable, right? Look at that little nubbin! So cute! Unfortunately, I’m no good at styling my hair the day after I get it cut. You’ll have to wait for a glamor shot! Do you get your “hair did” regularly or very rarely? Regular stylist or new every time? Planning any extreme makeovers? 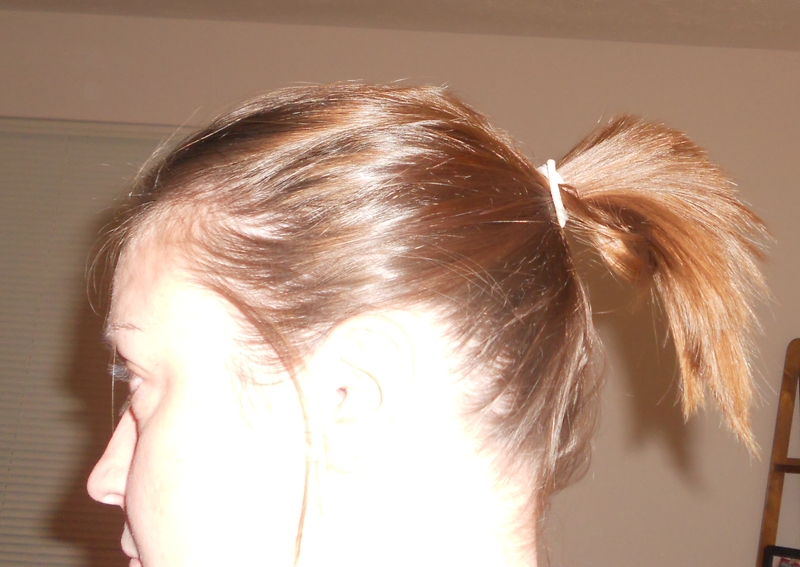 This entry was posted in January 2012 and tagged 2012, hair, pony tail by Pam. Bookmark the permalink.